In 2003, the province created a spatial data infrastructure (SDI) composed of the BC Geographic Warehouse, where the data is stored, and online applications allow the public, government staff, and businesses to query and download the government data. Over the last decade, the government of the province has digitally mapped the region's varied geography, creating a storehouse of geographic data to inform the public and improve decision making in the public services sector. User traffic and data supplier participation have increased consistently every year. To meet the growing and changing demands of users, the province recently collaborated with Esri, Vivid Solutions, and Latitude Geographics to improve the SDI. Using Esri's ArcGIS for Server, the SDI provides more than 3,400 user-configurable data layers that are viewable in dozens of specific mapping applications. The new technology excited government staff in the natural resource sector who managed enterprise and public access to the province's geographic data. Leveraging Esri's technology, the province created iMapBC, an online web-mapping application that made the thousands of geographic data layers in the warehouse available. 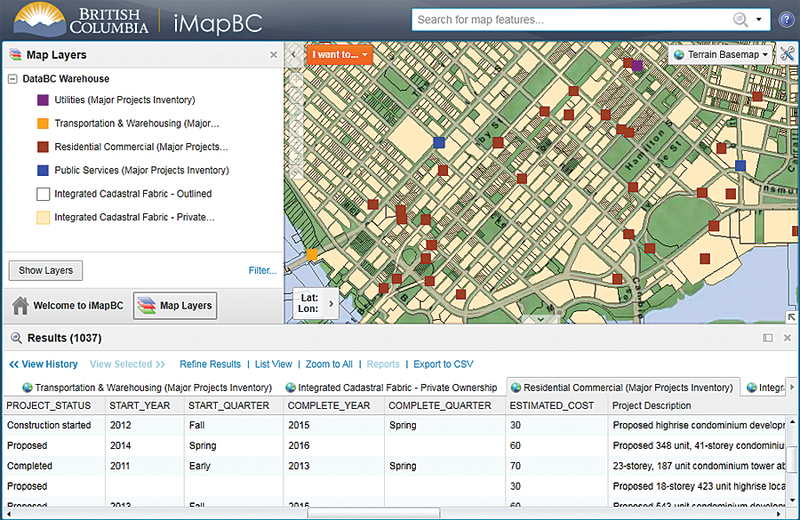 With iMapBC, users could select data layers to view, analyze, share, and print in custom maps. 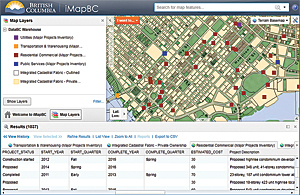 By 2012, iMapBC was ready for an overhaul to meet users' rising expectations for online mapping. The initial plan was to migrate over to Esri's faster ArcGIS for Server, but there was a problem. Although ArcGIS for Server was faster and had many design improvements, it lacked the dynamic layer support that users required. "The ability to manage layer configuration independent of the map service was key for an organization the size of DataBC," said Chris Spicer, access team lead at DataBC, the provincial program launched in 2011 that manages the SDI. Over the next year, Spicer and team came to Esri headquarters in Redlands, California, where they actively participated in the evolution of ArcGIS for Server. Together, the project team and the province created a layer catalog for its 3,400 geographic datasets that would be the source of the data in the new iMapBC's user interface. Using a server object extension, the interface displays a list of layers that users can add to client applications. Rather than preloading all 3,400 layers and taxing the province's server resources and slowing performance, the users can configure the data they want to display in their maps in the catalog. "We're extremely happy with the look and performance of the system," said Spicer. "It retains all the functionality that made it a hit with our clients and exceeds the goals of the DataBC initiative to optimize the way we work with large volumes of information."